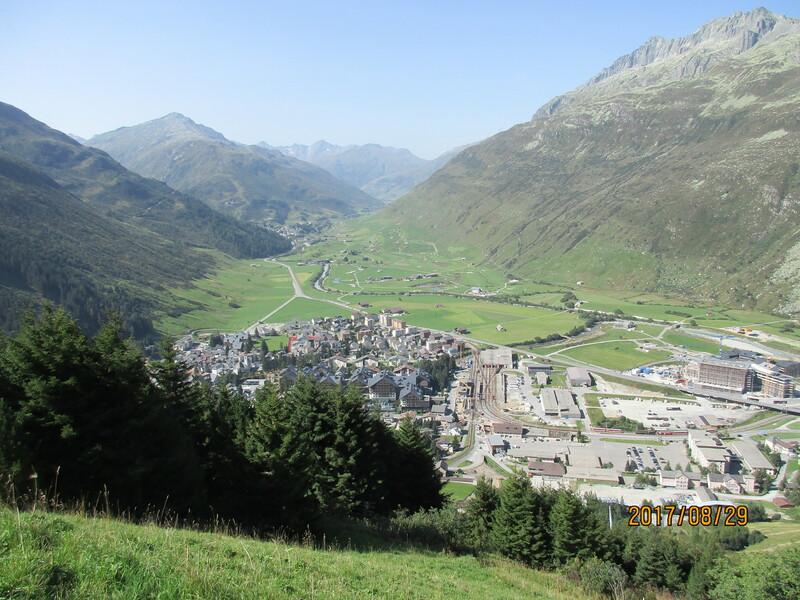 Andermatt is a small Swiss town of about 1,400 people. It has a very pretty downtown although when we were there in late August it lacked some of the feeling of life that you get in French and Spanish villages. When we were here there was an enormous amount of construction, including a whole new Andermatt Swiss Alps development project that will include six 4 or 5 star hotels and another 500 holiday apartments. Yet the town lacks a pharmacy! I came down with a very bad stomach bug while here but was unable to buy something as simple as Immodium. 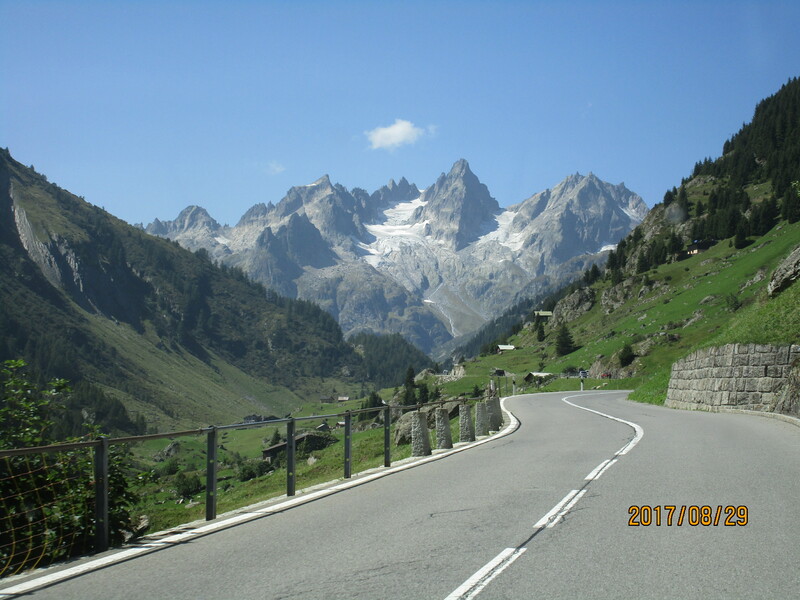 But, frustrations – such as the highly irritating church bells – aside, the surrounding country is truly beautiful and the climbs are sensational. We didn’t do nearly as much cycling as we’d have liked – because of my stomach bug then rain – but what we did was very special. There are basically two amazing loops from Andermatt: Susten-Grimsel-Furka to the north and Furka-Nufenen-St Gotthard to the south. And of course any of the passes can be done as single climbs or over-and-back climbs. There are enough tunnels on these roads that having a back light is a very sensible idea. These are two jaw-dropping climbs that sit at opposite ends of the valley. You can do them as part of bigger loops, or just do the two switch-backy climbs for themselves. 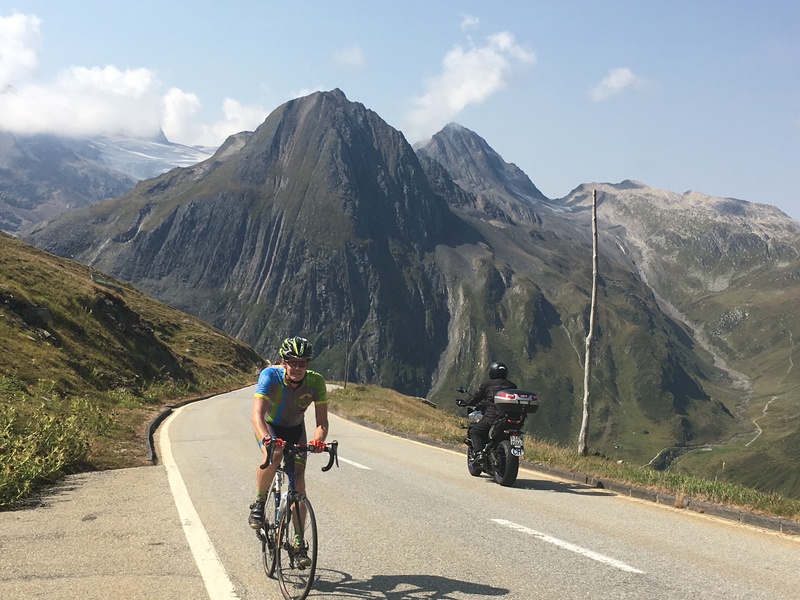 If you plan to do these two climbs not as part of a loop, you can either drive to the top of Furka Pass and ride down to the little village of Gletsch, or drive to Gletsch and park in the dirt parking lot across from the big hotel. Grimsel Pass is about 5.3 km with 400 meters of ascent, most of it in the 7-8% range. Despite its amazing appearance, it has only six switchbacks and is really quite short. But the road is beautiful and the construction incredible. From the top, ride back down to Gletch and turn left and head up Furka Pass. 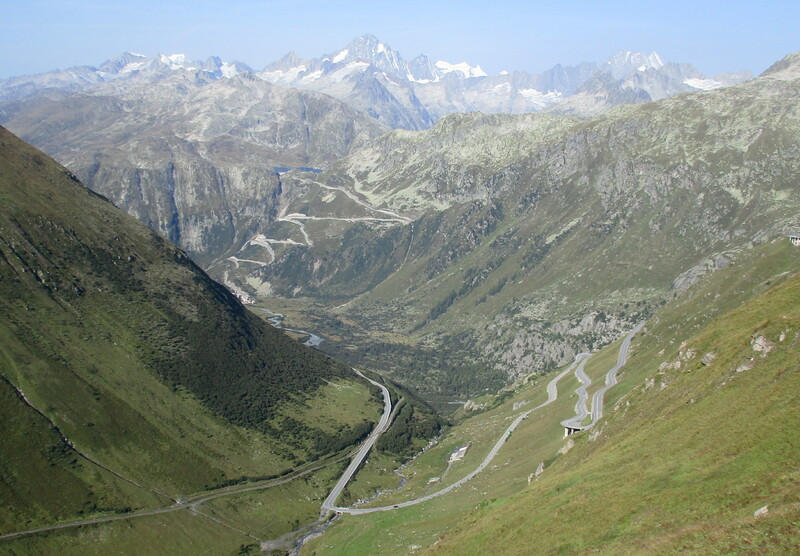 Furka Pass is about twice as big – 10.3 km with 657 meters of ascent. It’s not super steep – lots of 6%, some 7-8%, but it’s beautiful. You start with three switchbacks out of Gletsch, then a long straightaway where you can gaze at the big switchbacks on the mountainside ahead of you. Climb these then another straightaway leads to the top. This was the loop I wanted to do, about 104 km with 3,066 meters (10,059′) of ascent. It’s one of the great loops of the world. Not as good perhaps as the Sellaronda in the Dolomites, but still pretty amazing. 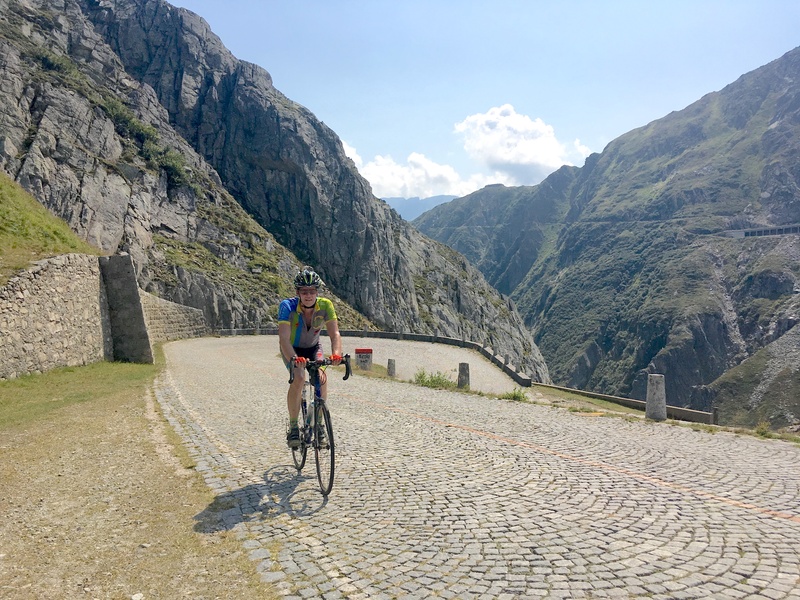 Do it counter-clockwise because the south side of the St. Gotthard Pass (also known as the Tremola Road) is one of the great cycling experiences. From Andermatt ride out about 9 km of flat and gentle uphill to Realp. 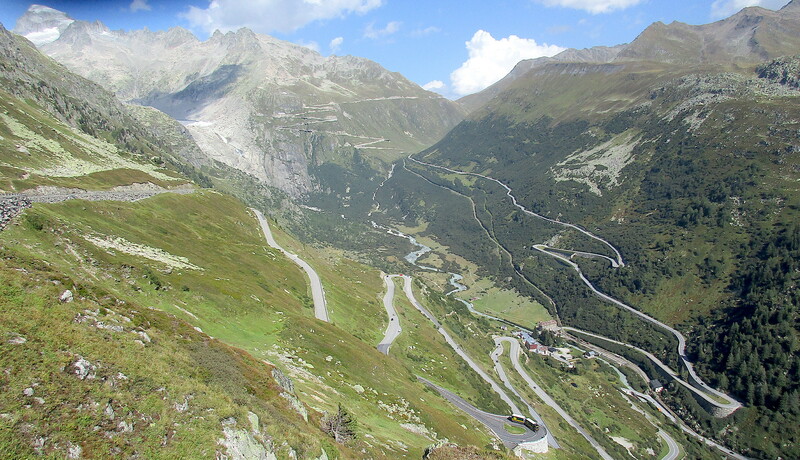 From here there are 5 km of switchbacks, with lots of 8%, and then the road just cuts across the hillside to the top of Furka Pass, which you reach in another 7 km. The gradient eases initially, then steepens for the last few km to the top. After the pass, the road surface changes from asphalt to concrete for the steep part of the descent, and a lovely descent it is too. Unfortunately you still have the high tension wires all the way down, which rather detract from the view. Once you’ve finished the main descent you have many more kilometers of gentle downhill into Airolo. Follow this road as it switchbacks up to a T-junction. Turn left, then follow this road to the top, avoiding all temptations to get onto the new road, and wishing the Swiss would create more signs to help cyclists. After a while the road turns to cobblestones, then it alternates cobblestones and asphalt for several kilometers, and if you are like me you are very grateful every time it changes back to asphalt. Finally, after climbing this road for about 7.5 km, at a very strange concrete building, the road turns to cobblestones for the final 5 km. These amazing cobblestones and the constant small tight switchbacks make this road truly unique and special – a once in a lifetime experience. Fortunately this long cobblestone section rarely exceeds 7%. On the most spectacular section, in 4 kilometers the road climbs 300 meters around 24 bends. This is the other big loop out of Andermatt. We didn’t ride it but instead drove it, just to see what it was like. It’s about 120 km with 3,850 meters (12,631′) of ascent. From Andermatt head north, steeply down the canyon, through various tunnels. After 10.1 km, at Wassen, turn left following the signs for Susten Pass, which you reach at km 28. The valley and road up to the pass are achingly beautiful. Driving up here made me love Switzerland and hate Switzerland. Love because it’s so beautiful. Hate because it reminds me that I’ve long since lost my youth and all the wonderful adventures that youth brings. Anyway, from the pass head down the other side of Susten Pass to Innertkirchen, which you reach at km 55.6. Turn left and head up the big side of Grimsel Pass. I didn’t think this side was anything special except for the last few kilometers which are pretty. 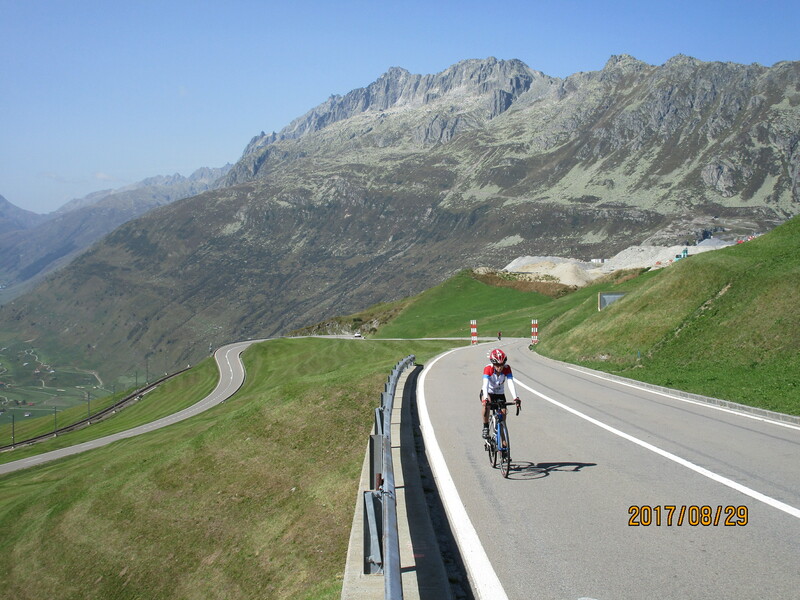 From the top of Grimsel Pass, which you reach at about km 82, ride down the amazing switchbacks and turn left in Gletch. 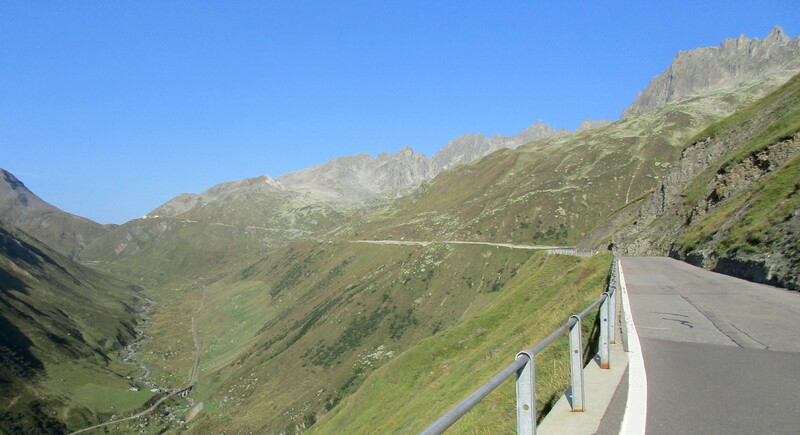 Ride up the beautiful big switchbacks of Furka Pass, which you reach at km 98, then down the much rougher and more terrifying road to Andermatt. Terrifying because of the dropoffs, and the fact that the road keeps varying between decently wide and very narrow. This is a fun little climb right out of the center of Andermatt. It’s about 10.6 km with 600 meters of climbing. It’s difficult to see exactly where the road goes from Andermatt because there is also a railway line that works its way up the same hill. The road is wonderful and it starts with about 5 km of lovely switchbacks, then it heads more easily up to the pass. There’s a long tunnel near the top, which has good lighting, but it’s still worth having a back light. You can pick up a map showing road rides and mountain bike rides at the Andermatt Tourist Office. Or you can download the map here. Six of the best Swiss Climbs. 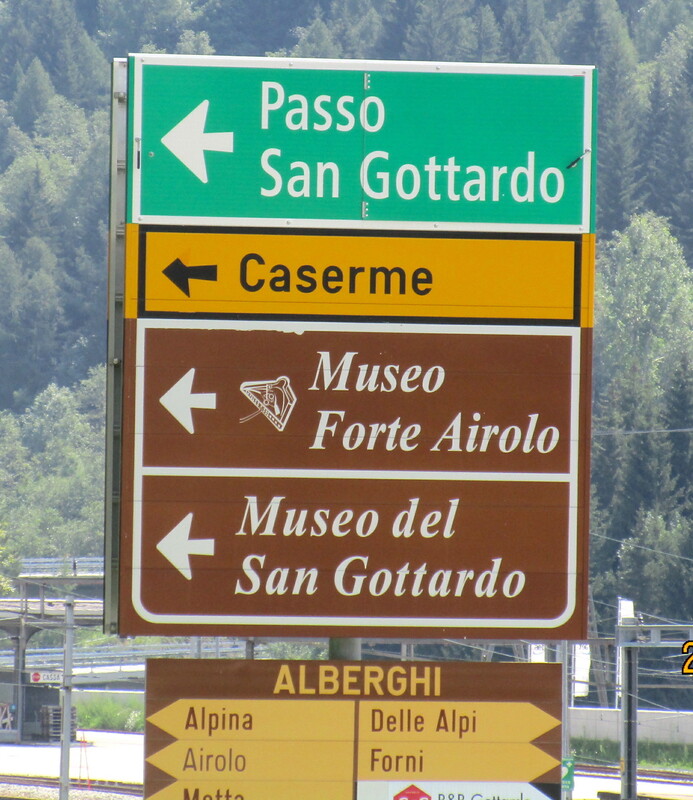 A page about the St Gotthard Pass road (Tremola Road). A very good Swiss map that has a wonderful zoom mechanism.